I am now amazed at the fact how all sorts of people can connect with one another. Yes, this is a realization that I think I’ve made a while ago but this recent incident made this concrete. An educator blogger named Shane from New York mentioned me in a post and linked my “About” page to it. See the article here. He talked about me and what I taught in my internship and mentioned my interest in technology in the classroom. It’s so neat to have my blog mentioned in another person’s — and for an amazing reason! Reading his post made me realize that through technology and blogging, we are closer than we think to others around the world. We can share ideas and thoughts. I thought it would be nice to mention him in a post, too. And he expanded my professional community by mentioning two other unique edubloggers in his post! Thanks, Shane! This has been another thought process from Helyn. For one of our tech tasks we were required to check out some coding sites and play around with some of the codes and think about how it would work in a classroom setting. This program was much easier to work with (and especially so because I’m just a beginner with no experience at all). I think something like these exercises will help students with problem solving and give them a chance to understand how games work — especially the Flappy Bird coding exercise. It is also relevant for high school students who are thinking of going on to major in something like Computer Science. This would be a way for them to get a feel of the program and what it all encompasses. If students have computers at home, their parents can become involved in helping the students solve some of these problems of coding and help their children understand how games are created. Programs like these would work well in a math class because they require problem solving skills — just like the Angry Birds game simulation I did above. You needed to look at the situation and figure out how you were going to get the Angry Bird to the pig. 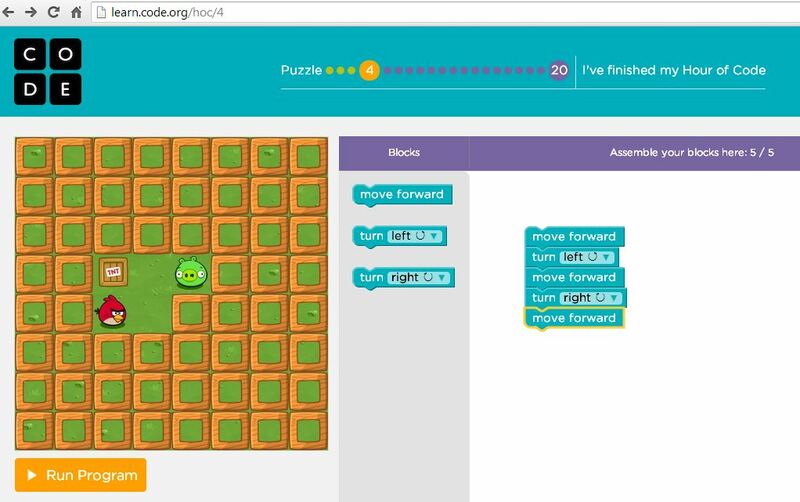 Coding is a neat way to bring something new to the students. An almost “behind the scenes” look at how games are made. Maybe having your students code could be a way to introduce them to the field of Computer Science. So many possibilities. In my Education English class today one teacher-to-be brought up the discussion of using blogs in a high school classroom. She was talking about how we need to teach students what to post on the internet. This would be a step to teach students that they need to be aware of what they are posting on the internet. And that whatever they choose to post could affect them if future employees are looking for them. They need to be aware of what they are posting on the internet — especially on social media sites like Facebook and Twitter. Blogging is a great way to incorporate internet and get students thinking about their image in the online world. Instead of writing in a journal, they could blog. One disadvantage to having students blog would be for some homes that don’t have the money for internet or computers/laptops. In my internship, I had a student in grade 10 who had a phone but it didn’t have data on it so he could only connect to WIFI. I’m not sure if he had internet at home but if I would have incorporated daily blogging into the class, he would have fallen behind if I didn’t give him class time. However, I think if it’s possible, blogging should be incorporated into a high school classroom — especially English. I think it would be a great tool to utilize if you are able to as a teacher. You could give students topics to write about just like we’ve had in my ECMP 355 class this semester. She finally went and grabbed a few pieces of paper from the printer and handed them to me. She produced a pen moments later. I stared at them, unsure of what to write. Finally I gripped the pen and the words began to flow. I wrote down my feelings about the situation and the questions I have. The words poured onto the page and I just let my mind take over. So if you’re ever feeling stressed or worried or afraid about anything in your life, grab a piece of paper, a napkin, a box, anything and just write. Write until your hand cramps and your brain turns to mush. So true. I always get these ideas but I never get the chance to get them down on paper or on my computer. I just wish they could appear before me. I wish they would just pop out of my head and into the computer. I was introduced to a bunch of useful teaching tools that use technology. I was immediately drawn to the first one – padlet.com — where you have a wall and can post anything on there. Whoever has the link can post on there, too. This would work great in any classroom because it would give students all students a chance to contribute to a class discussion. You could easily use it for brainstorming. For an English classroom setting you could brainstorm story ideas in a fun and unique way. For my first wall, I decided to do a “bucket list” style. Anyone could contribute their ideas on what would make a fulfilling life for them. I added a few ideas and I believe I’ll ask some of my friends to contribute their ideas. You can view and contribute to my wall here. Below I’ve posted a screenshot of what my wall looks like! Starting off a unit in English would be easy, too. You could have students brainstorm at the beginning of a new novel about what it was like to live in the 1930s (if you were doing Of Mice and Men). It would also be a neat to do as an ice breaker at the beginning of the school year. I will definitely use Padlet when I am in my own classroom. Even if students are doing their own independent research project, it would be a fun way to display the information they find on the subject. It’s an awesome program! And it’s that time of the semester where everything is going to be due. Less than one month left of my first University degree. It’s insane how fast this last semester is going and how busy it’s becoming. It’s time to catch up on everything and go hard for these last few weeks. So here’s my brief motivation post for the beginning of this week! Here we go! <a rel="license" href="http://creativecommons.org/licenses/by/4.0/"><img alt="Creative Commons License" style="border-width:0;" src="http://i.creativecommons.org/l/by/4.0/88x31.png" /></a><br />This work is licensed under a <a rel="license" href="http://creativecommons.org/licenses/by/4.0/">Creative Commons Attribution 4.0 International License</a>.